Edike made the commendation during a tour of the command on Thursday. The News Agency of Nigeria (NAN) reports that the monthly target for Seme command was N1 billion but it generated N1.2 billion in November. Edike said the confidence reposed on the command by the Comptroller-General of Customs, retired Col. Hameed Ali, for collecting revenue on rice through land border was not in vain. ``I commend all of you officers for surpassing your target which means you are all leaders in your duties. ``Your commitment to work impresses me and this has shown in your revenue collection for which you are paid. ``I am expecting nothing less than N2 billion in December because in spite of the economic downturn you are still determined to top up your target,’’ he said. 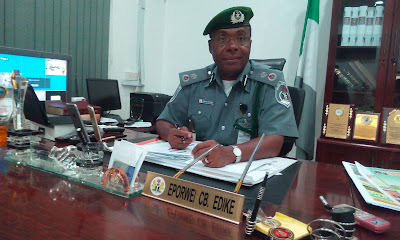 Edike urged the officers to put in more efforts, adding that officers of the command had wider latitude to make the country proud. ``Our major concern and obligation is how to generate revenue for government because the little money you generate is very important to government for administering the country,’’ Edike said. Responding, the Acting Customs Area Controller, Seme Command, Comptroller Hassan Sabo, expressed gratitude to the Zonal Coordinator for his words of encouragement to the officers. Sabo said there was hope that economic activities would improve in the command, adding that it generated N70 million from importation of rice, while the rest were from general goods. He promised to double the revenue target with the support of dedicated officers.